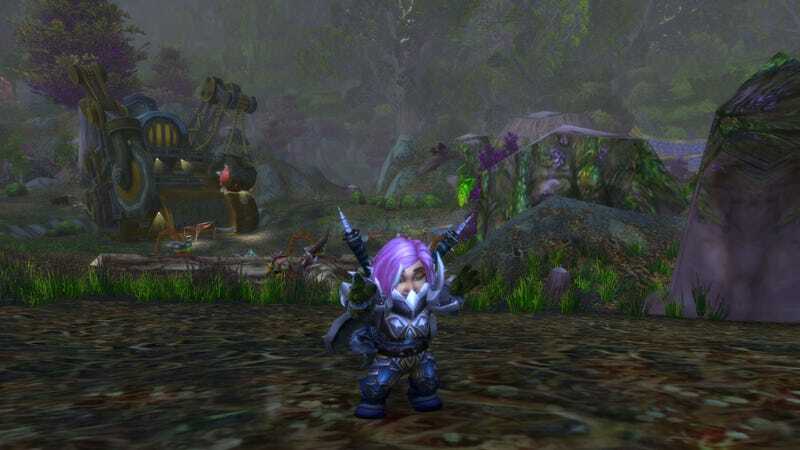 Before this week’s 7.3.5 update hit, leveling a freshly-made character in World of Warcraft as an experienced player was little more than a chore to do before getting to the good high-level stuff. With the introduction of level-scaling and changes to experience point requirements and monster health, leveling up is now a more enjoyable experience. That’s no longer the case. I started a level one gnome warrior named Jerboa on Tuesday afternoon. With the hours I’ve put in since, she should easily be at least level 40 by now. But there she is, level 22 and loving it. Another fun effect of level-scaling is that every enemy aggros now. No longer will gaining a few more experience levels render lower level creatures in a zone near-passive. There are no lower level creatures. OMG BEAR! RUN FROM BEAR! BEAR SO HUGE! Experienced players who’d rather speed through the leveling process can still roll a healer or a tank and spend the whole process running random dungeons. If they’re really in a hurry, they can always buy one of those boosts to level 100 Blizzard offers. But I’m enjoying the slow and steady grind. I’m visiting zones I normally would have skipped and exploring quest lines I’ve historically bypassed. Leveling has changed a great deal with this week’s update, but in many ways it reminds me of the good old days, when growing into one of Azeroth’s legendary heroes was more of an adventure.